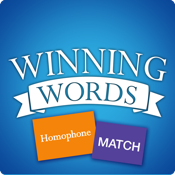 Homophone MATCH is an interactive, educational, fun match game for school age children, adults and lifelong learners. This app would also be beneficial for English Language Learners! The object of the game is to reveal pairs of Homophones by turning over the cards. - Choose from three levels of difficulty. - Choice of four different game boards. - The game can be enjoyed by up to four players at a time on the same device or you can play on your own. This app has been carefully designed by an experienced educator and can be used at home or in the classroom.